It took about 8 months and over 6,000 work-hours to finally complete the guide on best self inflating air mattresses, pads and mats. In the process, we had the help of our awesome panel of experts on outdoor gear – some of them made the initial choices to be tested and some did the actual field testing. The Top 5 five picks you’ll see below are a result of that process. We did our best to make this guide versatile by including different products – from lightweight pads to more robust and comfortable self inflating mattresses, like the Exped MegaMat. ‣ Size - 72 x 22 x 1.5 "
Before we even start talking about the Exped, let’s make one thing clear – we have NOT received free products when compiling this guide. We’re stressing that because some of the things that we’re about to say about the Exped will sound pretty wild. We stand behind every word. The Exped Duo Mega Mat is as close as you can get to the comfort of a regular mattress on a campsite. The rating of 97 / 100 is the highest that we have ever given to any product we reviewed. To put that into perspective, we reviewed thousands of sleep products, including regular home mattresses and none of those ever got above 95/100. That should paint a pretty clear picture about the Exped MegaMat – it’s camping luxury at its best. What’s better about the Exped? Who will choose the Exped? We’ve been testing and reviewing sleep products (both for home and outdoor use) for over a decade now. The total comes to about 3,000. We have NEVER seen a 100 % user satisfaction rating. NEVER. Just a point to illustrate that – at time of completing this guide, 95% of owners gave this Exped full 5 stars and 5% gave it 4. The answer to the question about who’ll get it simple – people who want to pamper themselves, those who put comfort above anything else and are OK with spending more to get it. It’s the only self inflatable mattress we know that allows you to control the firmness even if you wake up in the middle of the night, with a press of a button. The hardest part about rating it was the category of “value for money” – it is the most expensive product on this list, but how do you assign value to something as sophisticated as this? You can see what owners are sharing about their experience with the Exped on Amazon by following the links below. Among the classic self inflating sleeping pads, that the TNH premium Outdoors is the highest-rated, with an overall rating of 91/100. The best part about it is the price tag, which is much lower than similar products from other brands that (in terms of insulation, durability, and quality of the open-cell foam). With the R-value of 4, the insulation of this TNH stands shoulder-to-shoulder with pads that cost 2-3 times more. TNH is not to an industry giant, it was founded by two people passionate about the outdoors & sustainability (ethical manufacturing and biodegradable packaging). Who will choose the TNH? TNH is backed up by a limited lifetime warranty on all manufacturing defects, and a money back guarantee for on-arrival issues. We can’t think of any other pad close to its price range that offers this kind of warranty. The combo of the high R-value, the rugged materials used for the finish (75D polyester shell) and the warranty terms make the TNH top value for money among the self inflating pads. Over 600 people have shared their experiences with TNH on Amazon, you can see them all and compare prices by following the links below. The Kamp Rite is the same type of product as Exped but stripped of the sophisticated add-ons, cutting-edge technology and materials we’ve seen in the Exped Megamat. The two are the only products on the list that are mattresses in the true meaning of the word. With an R-value of 4, and the dense 4-inch thick foam Kamp Rite is great value for money. 77 inches in length and 15 inches wide, it comfortably sleeps two people. Who will choose the Kamp Rite? For people who are aiming for comfort but don’t want to break the bank the process, the Kamp Rite will do just fine. Compared to similar products from competitors, it’s budget-friendly, which is reflected in the high value for money ratings you saw above. Over 150 people shared reviews of the Kamp Rite on Amazon and answered specific questions. To see all of that follow the links below. The Deluxe Series from KingCamp is unique. 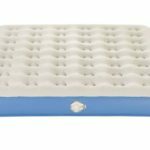 It’s designed for people who feel that a classic self inflatable pad is not comfortable enough and yet, a full-blown mattress is not an option, either because of the size or bulk. It comes in a range of sizes, from Single (78 x 25 x 3 “) to Double (78 x 51 x 3 “). You also have 4 colors to choose from: light gray (which you can see in the picture), blue, orange and red. As we mentioned above, this KingCamp will be the choice of people who need something in-between a classic pad and a self inflating mattress. Click one of the buttons below to see the user reviews and compare prices on Amazon. ALPS is a company known for the balance between quality and moderate pricing. A typical example of that is the brass valve of this pad, which you don’t often see in this price range (it’s usually plastic). The top material is what the company calls Ripstop fabric with a diamond-like pattern designed to minimize slipping, which is important if you pair it with another synthetic material, like sleeping bag. Let’s take a look at the ratings. ALPS Mountaineering comes in a range of sizes, from Short (20 x 48 inches) to Extra Long (30 x 77 inches). The bottom line is that it offers more versatility in terms of body type and will be the choice of people looking for a specific size. It’s one of the most popular self-inflating sleeping pads with over 1,300 user reviews shared on Amazon. The buttons below will take you there. In the rest of the guide, we’ll go into more dept about each of the self inflatable mattresses / pads we listed as our top picks. We’ll look at what makes them tick, detailed specs & main advantages and downsides. The mat you see in the picture above is the single version of the Exped (designed for one person), but we’ll be looking at the best that is the MegaMat Duo (comfortably sleeps two people). The Exped Mega Mat has an unparalleled R-value of 9.5 and will allow for comfortable sleep from normal to the most extreme circumstances. As per the specifications from the company, the R-value allows this self-inflating air mattress to be a solid option for temperatures as low as -54.4°F. 77.6 inches long and just under 4 inches thick, it makes a comfortable sleep surface for two people. The weight of the self inflating mat is approximately 10.2 pounds. The sack used to pack it weighs 0.44 LBS. This makes the combined weight of the package 10.64 LBS. The Exped MegaMat Duo 10 packs into a role that’s about 27.6 inches high and just under 12 inches in diameter. The volume of the roll is approximately 50 L.
Material used for the top of the Exped self inflatable air mattress is polyester (50 D) combined with a thin TPU laminate. It’s resistant to hydrolysis, embossed (honeycombed shape) and certified to adhere to the Oeko-Tex 100 standard. The bottom is also polyester with practically the same properties, but thicker and more durable (75 D). The open cell foam is 16 kg/m² PU. Much like the materials of the pop top and the bottom, it’s also certified (Oeko-Tex 100). The structure used to strengthen the profile of Exped mats is unique to the brand in the company calls it 3-D technology. The idea behind it is to strengthen the sides by encircling the mat in rigid sidewalls. It’s the 3-D technology that makes Exped mats unparalleled in terms of surface flatness and stability. The honeycomb embossed 50 D polyester of the top is covered by a thin layer of Tricot nylon. This type of nylon gently stretches to adapt to the body of the sleeper and complements the sturdiness of the structure. This is one big & bulky mat, there’s no way around that. If the foam were one-piece, it would be very hard to roll and pack. What Exped did about this is “break” it into 3 sections so that it can be rolled into a compact package. The two valves of the Exped Duo are state-of-the-art, using any other adjective would be an understatement. Unlike any other self inflatable air mattress, the Exped uses two valves, one to inflate and one to deflate the mattress, but that’s not the most interesting part. What’s impressive about the inflate valve is that you can actually control the firmness by popping it open and pressing on the flap for a second or two until you feel you found your sweet spot. The inflate valve has a small tab attached to differentiate between the two, which is a nice touch if you’re waking up in the middle of the night and want to make mattress just a bit softer. The first few times you use the mat, you’ll need to add some air by using the manual pump that comes included. This is a hefty self-inflatable mattress, and the practice of adding air for the first few uses is what allows the sections of the foam to fully expand and form. Soon, the self inflatable mat will unroll efficiently and set itself up. Depending on your firmness preference you can to add a bit of air. This touch-up comes down to just a few presses on the manual pump. To efficiently fold the Exped into a compact unit that won’t take much space in your trunk, just follow the steps outlined below. Step one – fold the mattress into thirds (top to bottom) and squeeze as much or as you can by using your body weight. Step two – fold it in half (sideways). Step three – start folding it into a roll. Pause occasionally and use your body weight to squeeze some more air out. Step four – close the deflation valve, pack the mat and you’re good to go. Let’s take a moment and give the TNH a closer look it deserves. For the environmentally-conscious people, the ethics behind the manufacturing of the TNH will be an important factor. The vision of the company is to ban all plastic being used for packaging bags and turn to biodegradable materials. This comes as no surprise since the TNH isn’t your classic corporate brand. The company was started by two people passionate about the environment and the outdoors. Minimizing the impact and resource depletion is a big part of what defines the brand. To put it simply – TNH is aiming for a low-waste and minimal-footprint approach to making their products. Having the vision of a low-waste world is something that hits close to home for most of us who love the Great Outdoors. But taking action based on those principles is a whole other story. Even the most environmentally-conscious camper will not choose a pad that doesn’t perform. That’s why we’re thrilled to see a brand like TNH giving the bigger companies a run for their money and. But let’s put all the environmental talk side and look at the actual quality of this pad. When it comes to self inflatiable mattresses (and pads), it’s all about the balance between the weight, packing size and durability. The TNH features a 1.5-inch open cell foam layer and, in its price range, the comfort and temperature isolation is unparalleled. With most brands, you won’t even see the specifics about the materials used for the finish. This means that you basically have no way to tell of how resistant it will be faced with the harsh realities of the trail. Over the months of testing, we’ve seen zero issues with the valve. The plastic is solid and doesn’t feel flimsy, so we can confidently say that the valve won’t be a source of problems, even in the long run. As a part the process of compiling this guide, we did some anonymous shopping with the brands. We can report back that we were very pleased with the friendliness and the personal touch of the customer service of TNH. The friendliness is secondary here. What’s more important is that the brand actually stands behind the claims they make about the warranty and are very flexible and efficient about it. You’ll see no delays and runarounds if you do decide to claim the warranty for whatever reason, and it’s up to you to choose whether you want a refund or replacement. The whole process typically takes 2 to 3 days. What you usually see this price range are pads that are much thinner than the TNH. The reason behind using thin foam is not only to cut cost but to make the pads lighter and more portable, too. This goes back to finding the right balance between the “amount” of foam and padding. The TNH seems to have found the sweet spot between the two since the past is more comfortable but packs just a small as some of the much thinner products. The R-value of the pad is crucial for temperature isolation. To increase it, most brands simply go with thicker foam. Instead, TNH took a different approach to improving the temperature isolation properties and making the R-value higher. They did it by carefully choosing the extra padding that ”engulfs” the foam. The cells of low-quality “open foam” can burst, and this usually triggers a chain reaction. What you mean by “chain reaction” here is that more pressure and stress is exerted on the “neighbor” cells, and before you know it you got a bulge forming on your pad. The incidence of this issue is a very low with the TNH. This is a big deal since it tends to happen frequently in this price range and it’s one of the problems that can render your pad useless. Even if a pad is punctured, you can still use it because the foam offers padding of its own (as opposed to classic sleeping pads). This means that bursting of a cell is more of an issue than a pinhole. The setup is pretty simple and takes about a minute and a half. You just open the valves and give the self-inflatable mattress time to unroll. Once it fully unrolls give it an extra 20- 30 seconds for the open cell foam to stabilize and simply close the valves. We’ve seen more questions about deflating the Kamp Rite because (as outlined above) the setup and inflation is pretty straightforward. Packing down to and folding it into a compact package is a more frequent question, so let’s make a step-by-step outline on how to do it. Before you even start, try to find a surface that’s not slippery to place the self inflating mattress on. This will go a long way in making the packing easier because the bottom of the mattress is slippery and with it will be much harder to roll if you pair it with another synthetic slippery surface. For example, synthetic canvas fabric might not be the best option. Also, make sure that the surface is fixed and isn’t moving, you’ll find it difficult to roll the Kamp Rite if both the mattress and the surface underneath are sliding and moving all over the place. For a Double size of the Kamp Rite , you’ll need two people following the steps outlined below at the same time. Step four – while firmly holding the roll, move it away from your body just slightly to get a better grip. Pull it back towards you and press it with your knees again. Step five – take brief pauses of about 2-3 seconds between each roll and squeeze as much of the air out as possible. These brief pauses will allow you to use her body weight to make it compact. Step six – as you go the roll will get thicker, so increase the pauses you take between each step to allow more time for the air to escape. Step seven – once the self inflating air mattress is folded to a compact troll, close the valves while still maintaining the pressure of your body weight. Step eight – as you close the valves you’ll notice that the mattress maintains the rolled shape on its own and you don’t need extra strips or rope to secure it. If we exclude the Exped mat as an outlier, the Kamp Rite is the best self inflating air mattress in our ratings. ALPS is primarily known as a company that offers moderately priced products for outdoor sleep, ranging from self-inflating sleeping pads like this one to some ultra-light classic pads. Since this ALPS Mountaineering comes in 5 sizes, let’s take a moment here to precisely define the differences between them, starting from the smallest (short) all the way up to the extra long. What’s usually different about the materials ALPS Mountaineering uses their products is the finish. For example, the Comfort Series is layered with suede-like material. In the case of the Lightweight Series the fabric is treated to be less slippery with a rip-stop fabric. The rip-stop is used for the top, and the finishing touch is the diamond-like fabric. The bottom is made of taffeta polyester fabric that’s known for its durability and resistance to scratches, abrasions and punctures. What you typically see in this price range are valves completely made of plastic, which is not necessarily a problem in the plastic is tough. However, there’s no dilemma that using brass instead of plastic is the more reliable option. In the case of these ALPS, the valve self is brass and “lid” is brawny plastic. For the XL, ALPS included a second valve for faster deflation/inflation. Similar to the TNH, this product is backed by a limited lifetime warranty on all defects. Temperature insulation In its price range, this ALPS Mountaineering has one of the highest R-values (4 for the regular size). Howbeit, the R-value varies between sizes, and the mentioned 4 applies to the Short, Regular and Long. The Short MC has an R-value of 5 while the Extra Long is listed at 6.9. We found the carry sack to be fairly durable for majority of scenarios. The one downside is that it’s not waterproof or resistant. So, if you’re planning a camping trip and expect rain, you’ll need some type of extra protection. This can be as simple as a trash bag. It includes a patching kit which consists of a small vile of glue and a few patches of fabric. Small punctures are not so much of an issue which self inflating mattresses and sleeping pads. Most of pinholes even go unnoticed, especially in thinner products. It’s the nature of the open-cell foam that’s a pinhole will be localized – which means you won’t notice any significant deflation. A more important quality aspect is the membrane of the cells. In the membrane pops, you’ll soon see a ripple effect that will form a bulge. Let’s summarize what we’ve seen with this ALPS in a concise list of PROs and CONs. no rubberized anti-slip surface (which is featured in their Comfort Series). This makes it more prone to sliding if placed on another synthetic surface. We’re pretty confident that we’ve covered all the bases when it comes to choosing a good self inflating mattress or pad, but the work goes on. Updating the information presented is crucial to keep it relevant, so we do it on quarterly or 6-month basis (depending on how much new information we gather). We’re all about engaging with our readers, so don’t hesitate to ask any questions, reach out with dilemmas you might have or simply share your opinions and experiences in the comment section below. You’ll hear back from us within 1 day.